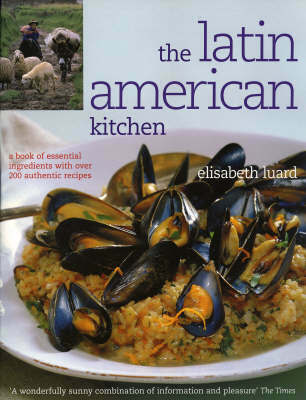 Ranging from Mexico to Patagonia and the distinct island cultures of the Caribbean, renowned food writer Elisabeth Luard surveys 100 essential ingredients and 200 regional recipes to provide a superior introduction to Latin American cuisine. Each ingredient is highlighted in a separate entry that covers its appearance and taste, medicinal properties, manufacture, buying, storing and culinary use. Alongside this information are two classic dishes, which range from simple spoonbread and fishermen's fishcakes to more elaborate stuffed frying chillies or turkey roasted in banana leaves. As a collection, the recipes include old favourites, such as Brazil nut cookies or margaritas, as well as little-known specialities like Ecuadorian bouillabaisse. With many fascinating asides on the lives and lore of the diverse people of this vast region, "The Latin American Kitchen" is more than a cookery book. Like the other books in the series, it evokes the richly varied cultural traditions from which its featured dishes originate.